We had our first gig of the new year this past Friday night. 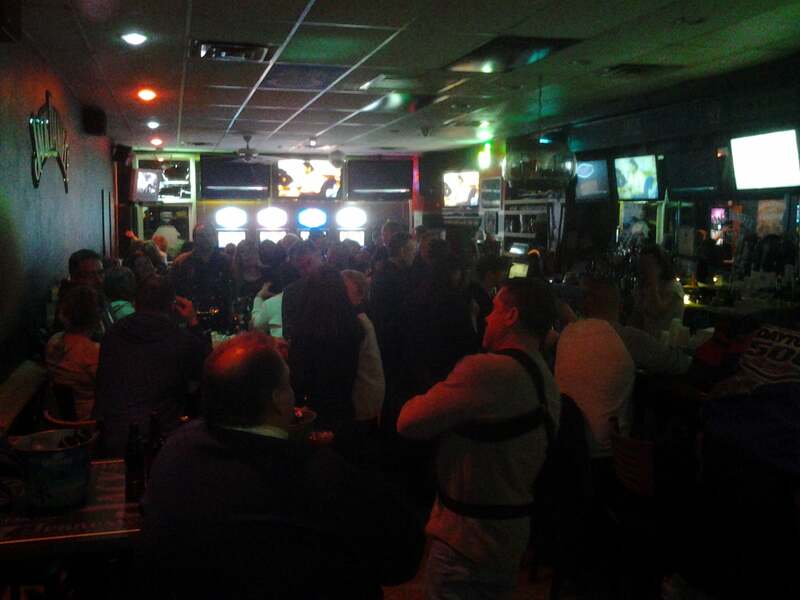 It was also our first gig at Double J Sports Bar in Joliet. We’d survived the great Polar Vortex of 2014 which had dumped over 2 feet of snow and then the temperature had dropped to -15 Fahrenheit (-26 Celsius) with wind chill down to -42 Fahrenheit (-41 Celsius) on Monday, but Friday managed to get up to 38 Fahrenheit (3 Celsius) and rain, which meant a lot of water and black ice. What does all that mean? It means we were all ready to have some fun! Just look at that picture we took while we were setting up for the gig. A lot of people were ready to have a great time and we were there to help them out. If you’ve never been to Double J Sports Bar, you haven’t met the owner Jeff. Jeff is more than happy to tell you a bit about the bar. He’ll sat with me on break and told me he built the bar 13 years ago for his friends. And Jeff has a lot of friends (might I remind you of the picture?). In fact, I even said this on my personal accounts on social Media, you may enter a stranger, but you leave a friend. I’m pretty sure that’s just the way Jeff likes it. I know that’s the way his friends like it. Well and so much more, like going from Brian May’s guitar solos on Queen‘s ‘Crazy Little Thing called Love’ to Carlos Santana‘s guitar solos on ‘Smooth’, right next to each other, never missing a beat. We were booked to play three hours with an option to do four and we did the four and a few extra requests. Because we can and that’s what we like to do too. We can’t wait to go back again, and in the summer, there’s a patio as well, yeah, that will be heaven…And we’ll play it too, by Los Lonely Boys.